Jon Blaza, who has spent the past eight years working for Bam International Bv as a Project Engineer and Siobhan Butler who works as a Senior Geotechnical Engineer for the Canal & River Trust, have been awarded the protected title of Chartered Engineer and membership of the ICE. This allows them to add the letters CEng and MICE after their names. The ICE’s professionally qualified grades of membership are internationally recognised, and are viewed in the engineering sectors worldwide as a significant achievement and a benchmark of an engineer’s competence and professional standing. Jon said: “Students considering a career in engineering should take an interest in the world around them and how things work, and at the same time pay attention in maths and science classes! Siobhan, 32, who grew up in Ireland and studied for an MSc in Engineering Geology at the University of Leeds, said: “Passing my professional review is a great honour and gives me a qualification that I can take with me and be proud of wherever I choose to work in the world. 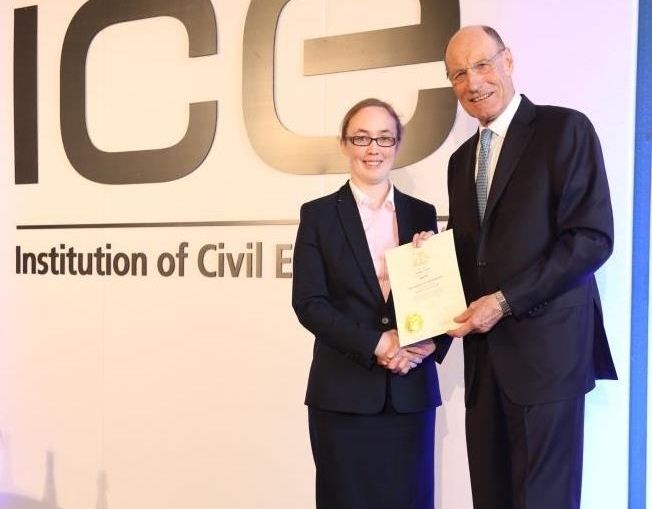 ICE regional director for Yorkshire and Humber Penny Marshall said: “Civil engineering sits right at the heart of society. It is all about shaping, improving and protecting the infrastructure that we all depend on in our day-to-day lives, from bridges, roads and railways right through to energy networks and water and waste infrastructure. “The Smart Motorway improvements to the M62 and Emley Moor Mast are examples of the work of our civil engineers.